Caritas Europa: End humiliating situation of migrants on Greek islands now! Home EU INSTITUTIONS Caritas Europa: End humiliating situation of migrants on Greek islands now! A picture from the Kara Tepe Refugee Camp on Lesbos Island, Greece. As a result of the EU-Turkey deal that was struck two years ago, over 13,000 women, children, and men are confined to reside in humiliating conditions in overcrowded reception facilities or in filthy makeshift camps on the Greek islands nearby Turkey’s coast. Caritas Europa and Caritas Hellas (Greece) call on EU and Greek decision-makers to transfer these people to the mainland and to give them a chance to rebuild their lives. “When we first arrived here I was very happy! We felt relieved and safe. We did not mind the bad conditions. We were expecting that we will move soon… I do not understand why my family here is treated like this. We have spent 3 months in the tent, in the dirt and 1 month in a container with other families. I regret to come here. I want this to end”, said M.S., a 42 year-old man from Iraq. He and his wife E.S., a psychologist, had five children, until their 12-year old daughter was killed. “After this event we decided to leave Iraq and come to Europe for a better life,” explained M.S. to a Caritas Hellas staff at the camp of Vial on the Island of Chios. The family arrived to the camp five months ago and is still stuck there waiting for their asylum application to be processed. Since the EU-Turkey deal was signed on 18 March 2016, Caritas Hellas staff members have met many families like the one described above and have witnessed how the deal has brought much suffering to the people who have arrived to the islands since they are confined to appalling conditions. “It is unworthy of European values, of human dignity and solidarity for vulnerable people to be left year-round to reside in filthy, makeshift camps or overcrowded and unsafe reception facilities, lacking basic services and hygienic facilities. Immediate action must be taken to address this and show commitment to protecting human dignity,” says Shannon Pfohman, Policy and Advocacy Director at Caritas Europa. This misery, combined with the fear of being returned to Turkey and the uncertainty about the future fuels anxiety, acute mental distress and suicide attempts. UNHCR has also reported about rampant sexual violence and harassment against women and children living in the camps. 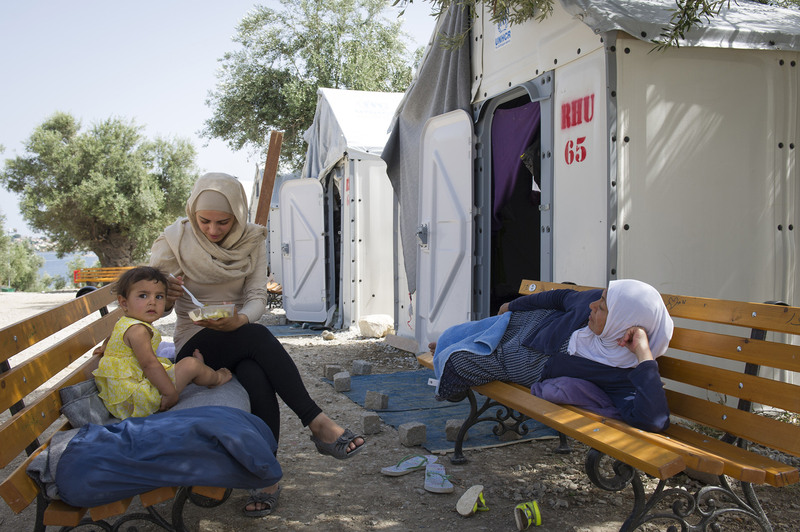 In some cases, UNHCR has even described bathrooms and latrines as “no-go zones” after dark. A woman confessed not having taken a shower in two months out of fear. Against this backdrop, Caritas reiterates its call on the Greek government and EU leaders to put in place all necessary means to urgently move people to the mainland in order to better protect the human rights of these vulnerable people. While recognising that around 7,000 people have been transferred to the mainland so far, Caritas encourages nonetheless that the pace of evacuation be immediately stepped up, since the situation is reaching breaking point. Caritas Europa supports Pope Francis’ call to welcome, protect, promote and integrate those who come asking for our help, like the family of M.S. and E.S. “I want to try every day for the best. I do not lose my hope, I want to invest in myself and my family, find a house and settle down. I want to start my life again. I want to help the refugees and work as a psychologist again”.